Dortmund, Germany-based Tintometer GmbH presents its new micrprocessor-controlled “SensoDirect?? 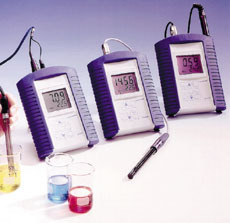 hand-held meter range from Lovibond. It meets the day-to-day demands on sturdy and reliable systems for the measurement of pH or redox, conductivity/TDS and dissolved oxygen. The water-tight housing is in compliance with IP67 and equipped as standard with protective armouring, and the built-in electrode holder ensures reliable operation even in extreme ambient conditions.